I wrote last week on Facebook about needing an idea for a creative group costume for three of my daughters and me to wear to an annual family Halloween event that has become a special tradition for our family. I thought you should see a picture of how it turned out. No. That’s not me. Yes, those are my kids. At the family party. Without their mom. Anyway. I took Valentine to dance a smidge early so I could get back on the road to get home in time for the party. But, traffic on I-5 had other plans. I switched freeways. I tried side streets. Everywhere my GPS just showed RED. I inched along, barely, and about a half hour into the trip, it became clear to me that I would never make it in time for the big costume contest that my girls were so excited to enter together as a family. I called my dear friend and neighbor Nicole. Would she please let the girls know that I was stuck? That I was trying? 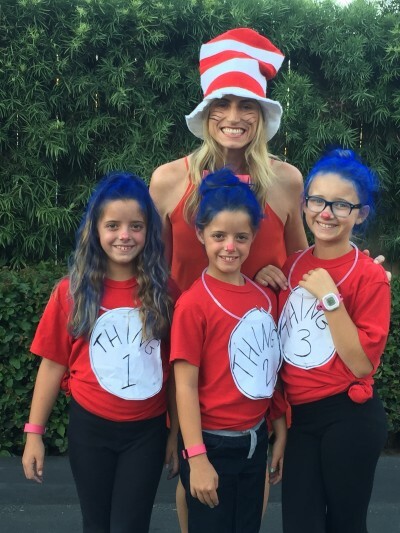 And that I wanted more than anything to be back in Coronado, spraying my sweet and squealy daughters’ hair blue to be Dr. Seuess’ Thing 1 and Thing 2 (and Thing 3, because we had an extra kiddo) to my Cat in the Hat I had borrowed from my other amazing friend Beth. Nicole assured me the kids would be fine. I wasn’t convinced, but it didn’t matter. What were 3 Things without Cat in the Hat, I wondered. But, I had no choice in the matter of my arrival at the party. My husband called me from Seattle to wish us a good time at the party. I told him I was stuck on the freeway, and I felt my eyes tear up, totally against my will. Because I know deep inside I’m a good mom; I really do. It wasn’t like I was missing the party because I was binge-watching Oprah (oh – remember the years when I had time for Oprah? I digress…) But I felt like a failure in that moment. An honest, true mom failure. Nicole called me back. (Yes, I was able to manage all this phone-talking because that’s how little I was moving – a near standstill. Please don’t drive distracted by phone calls or texting, I beg us all.) Nicole called me back. Could she go to my house and get my costume and be the Cat in the Hat? Could she be me until I could? Yes. Yes, you can, Nicole. Please be me. And so she did. And she sent me this exact photo. Which warmed my heart. I got there as fast as I could. But it still took close to two hours. I got to the hotel where the party was long after dinner and dessert had been served, but my amazing friend Heather rallied up a plate of Caesar salad for me (and even a takeout container for Valentine for after her dance classes.) Nicole whipped out her black eyeliner and drew me a cat face right there in the ballroom, and tied on my homemade paper bowtie, and popped the hat on my head and within sixty seconds, I was Cat in the Hat. I was me again. The girls were thrilled and we walked down the costume runway together and posed for photos. They told me all about spraying their hair blue with Mrs. Cohen, the awesome party trick-or-treating and the biggest news of the night: Margaux had won the limbo contest, and had a sparkly notebook prize to prove it. It wasn’t long before we were headed home (such is the fate of a party-goer who shows up hours late). I thanked the girls for understanding and for being flexible about Nicole taking my part. They were sad I’d missed so much party, but they were brave about it. Charlotte said not to worry, because Mrs. Cohen was “like a second mom” to them, so they had fun. Moms out there, aren’t we blessed to connect with other women who will take in our kids like their own? They say it takes a village to raise children, and I believe it. I wasn’t deliberate about building my village, so I feel extra grateful I have it. If I were to give any new moms advice, that would be it: build your village. Find the Nicoles, Beths and Heathers in your life, and be one, too. Take time to build relationships that will surround your family with love and support – people who share your joy and double it, and stay with you in sorrow and halve it. And people who have keys to your house so they can grab a costume and be you when you can’t be.